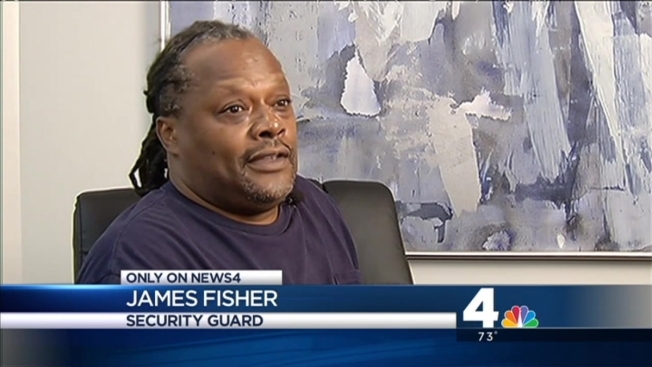 A security guard who spent 45 minutes trapped inside a guard shack when a van crashed into it last month in Maryland admits he thought he was going to die. A van plowed into the shack outside an apartment complex in Temple Hills July 18, trapping James Fisher inside while crews worked to rescue him -- and keep him calm. "There was nothing I could do to defend myself," Fisher explained. "[The driver] was like 10 yards away going 50 miles per hour ... I thank God I'm alive." Prince George's County firefighters responded to the scene and helped talk Fisher through the rescue as oil from the van dripped on his face. Miraculously, he was pulled out 45 minutes later without a broken bone, though he had pain in his hip, right thigh and lower back. A nearby crowd had gathered and cheered when they saw him being pulled out. "It's out of sight, man," Fisher said. "I didn't know that many people cared about me." The crash remains under investigation, and police say no arrests have been made. "He suffered injury as the result of someone else," Fisher's lawyer Andrew Bederman said. "He's getting medical care and hopefully getting better." Fisher is hoping to get back on track now that he's out of the hospital. "I've got to get back to where I was, which is healthy," Fisher said.